OKR (Objectives and Key Results) is a recent leadership foundation that helps organisations set, communicate, and measure their goals. Primary function of OKR is to connect an individual´s personal objectives with the team and the company in a hierarchical way. The main goal of OKR is for every member of the organisation – from the key stakeholders and leaders down to the team members – understand the objectives of the company through a set of defined, specific and measurable actions. Because of today’s complex nature of organisations, team members often find themselves feeling lost among the rapid changes they deal with every day. It happens often that employees feel discouraged and have a lack of purpose just because the company goals and strategic plans are too high-level and abstract. There are numerous small and large companies that have adopted Objectives and Key Results to achieve their goals. Among these are Twitter, Oracle, LinkedIn, Trello, etc. But it wasn´t entirely a new concept. One of the companies that started using OKR long ago is Google. When Google was just starting their business, one of its investors, John Doerr, suggested using OKR. The idea was actually adopted from Intel and proven to be highly effective. Rick Klau, Google Ventures partner gave an insight in one of this presentation about how OKRs work at Google. Using OKR is very simple. It starts with setting up an Objective and followed by identifying Key Results (Key Results should be quantifiable as it´s the only way to find out whether you have achieved your objectives). Your objectives shouldn´t only be measurable, but they should be as concrete as possible. Stating you want to increase your sales is not concrete and measurable, it´s abstract. Instead, you can define that you want to increase your sales by 30%. At Google, objectives are set annually and quarterly. When Rick Klau took charge of Blogger – a blog publishing service owned by Google – he set a quarter objective to improve the company´s reputation. Annual OKRs at Google are normally more high-level, enclosing the quarterly objectives. What´s important to note is that they change and evolve as the need emerges. Google adopts OKR accross whole organisation, at managerial, team and even personal level. This ensures that everyone gets things done to achieve the company goals. By the end of each quarter, all stakeholders at Google rate their key results. The scale at Google is 0-1. The idea is not to reach 1 in every Key Results, otherwise, it is assumed that the Key Result was too easy to achieve. Employees at Google aim for a score of 0.6-0.7. Transparency at Google is important. Everyone´s OKR are visible. Everyone can see each other´s OKR and their scores. It helps them understand what others are working on. Probably you´ve understood the main purpose of OKRs and how it can benefit your organisation. The real challenge though is setting up your own OKRs and analysing the Key Results to achieve your company objectives. Objectives – depending what your role is, you start by identifying 3-5 key objectives of your company, team, or on a personal level. While objectives should be ambitious, they should also be measurable. You, as a manager, you should make sure that such objectives are carefully communicated to everyone on your team. Key Results – the “objectives” answer the question “What?”, whereas “key results” answer the question “How?”. Key Results must be quantifiable, achievable, clear, difficult, but not impossible. Most importantly, Key Results should be measurable. This is the only way to track your or your team’s progress, understand the issues, and develop/improve processes along the way. There is one element we may not forget to mention – tactic. Tactics fall under Key Results and inform the “how” part. Note that tactics are different from the tasks. They are strategies that are used to perform those tasks. Normally, you may deal with tasks using a project management tool, such as Trello or Asana. These tasks fall under tactics. Often, you may need a combination of different tactics to achieve the Key Results that support your objectives. How often do you establish an OKR? The frequency of setting your goals is called cadence. If you have several departments in your organisation, it´s important that each department has the same time constraint to help with coordination and avoid complexities. You may set annual and quarterly goals within your company. Just remember, OKR is meant to be a simple process. In most organisations, Key Results (KRs) are used among teams, not in management level. Teams don´t create the goals (unless they are personal goals), but managers or leaders they assign the goals for teams. They normally own the KRs. Managers or leaders will have contributing goals, but won´t have KRs. The goals are higher level goals that have the same attributes as the KRs, which are aligned with the senior goals. 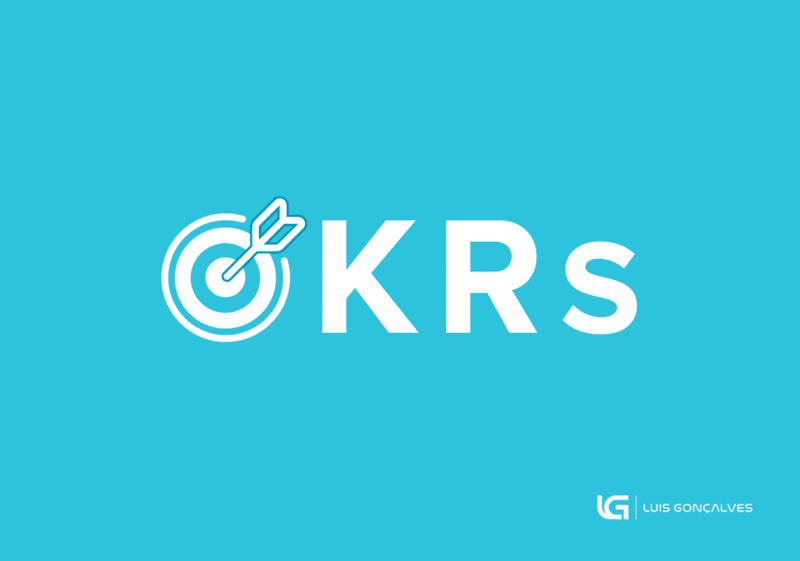 Introduce the concept of OKR to your team, explain how the KRs work and how KRs effect their performance. Explain to them that the purpose of the OKR is to also make them feel uncomfortable when they set ambitious goals and miss it (as long as they are making some progress). Encourage them to go outside of their comfort zone. Ask your team members to take part in brainstorming sessions. Don´t forget that your team goals should always be aligned with the senior goals (company objectives). Try to come up with 3-5 objectives. When you´ll review your initial list of KRs what may happen is that you will revise your objectives. If you´re very confident that you´ll hit your KRs, that means you´re not being ambitious enough. To get out of your comfort zone, try increasing your target one level up. Getting feedback is crucial, especially for those who will be involved in the execution. Listen to the feedback, some people might give you great suggestions to improve your OKR. A critical aspect of measuring KRs is scoring. If you´d like, you can use scoring that Google uses. They use scale of between 0 and 1. Committing to a goal helps to drive performance among employees, some studies have shown. Setting challenging goals motivates your employees to perform well. OKR is a goal-setting system that helps organisations to set ambitious goals and achieve them through measurable actions. OKRs should be set quarterly or annually. It´s important to focus on objectives that can be achieved within a certain time frame. Setting OKRs gives every leader like you a clear guidance on what to focus on during a given time frame. By adopting this popular strategy, you can tremendously foster growth and success within your organisation. In this blog post, Luis Goncalves discuss Smart Goals! He describes why in his view these goals cause more harm than good.